This is a scientifically proven element of doing well in SCD. During...every...single...series...the person who has done the very first dance has made it into the final. Take a look; Natasha Kaplinsky, Julian Clary, Darren Gough, Matt Dawson, Matt Di Angelo, Tom Chambers. Not only has every single one made the final of their series but half of them have actually won it! Maybe it is fate, maybe it's guts, who knows, but it appears to be true. Let's face it, if you are serious about winning the long multi-spangled game then you have to quit your day job, as Tom Chambers proved last year. Maybe if Lisa Snowdon hadn't been getting up at 4:30am every day for her radio show it could be a different story (I regularly have to get up at 4:30am for work and in the afternoons I have to make sure I don't fall asleep on public transport, let alone know if my fleckerl is right). But look back...the only celeb to win whilst still doing their main job was Natasha, which doesn't really count since the series was only about 6 weeks long. A rather curious fact we have recently observed (not that we don't have anything else to talk about or anything) is that all winners of SCD have been brunettes. Alongside that a number of perfectly good, yet blonde, dancers have been pipped at the post - Zoe Ball and Emma Bunton to name a couple. Emma didn't have a day job, but should have reached for the hair dye! Also note, gingers don't do that well either - Patsy Palmer and Aled Jones both showed promise but didn't make the finals. Ali Bastian and Zoe Lucker have a lot of work ahead if either is going to break this trend. 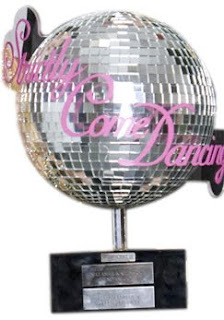 This is both a literal statement and slightly extended metaphor; to win SCD you have to get out there and embrace the sparkle. For example, if you are Darren Gough or Ramps you simply have to give in and wear that multi-spangled outfit. But also you have to give up your life and just give in to the glitter and 70 hours a week training. Take Natasha, she plotted ways to break her ankle for weeks but finally gave in and spangled her way to the final (yes, i have just created a brand new verb...) And look at Tom, he 'embraced the sparkle' right from the start and even forced his wife to join in by having SCD invade their wedding day. And, as for superfan Alesha, with all her buzzing enthusiasm from the start, well, she might as well be re-named Princess Sparkle. (Start first) - (Day job) + (Brunette) x (Latin Pro) + (Sparkle) = VICTORY!